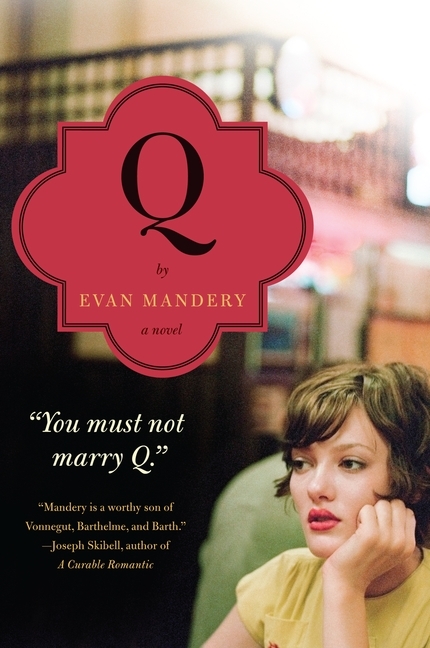 When I read that Book Club Girl was doing a show with Evan Mandery author of Q: A NOVEL, I immediately signed up to participate. The premise of this novel sounded very unique and like nothing I've ever read before. In one way, it sounded a bit like science fiction with a time travel element. But on the other hand, it sounded like a coming-of-age story. I figured I'd give it a try since I love coming-of-age tales and personal growth stories. I just hoped that I'd be able to accept the sci-fi parts. As I read the first part of the novel, I found myself really enjoying Q. I appreciated the narrator's voice and I enjoyed learning about his relationship with Q. In many ways, it was a sweet love story and I was definitely intrigued when the narrator's future self showed up. All was good -- the character development, the storyline and the writing; however, it didn't exactly stay that way for me. I found myself gradually losing interest in the narrator's life story and the novelty of the future selves (with their words of advice) eventually wore off. I won't go so far as to say that I didn't want to finish the novel, but I was disappointed that the beginning was my favorite part. Was there something specifically wrong with this novel or the story? I don't think so. I'm pretty sure it was just me since there are plenty of extremely positive reviews out there. I just think I enjoyed the initial direction of the story, when Q was a major character, much more than what occurred after Q was gone. Then the story became all about the narrator, his future selves, and his choices. Furthermore, the book started reading more like a philosophical treatise with many profound ideas about life. At times, I found that these ideas weren't resonating with me; and at other times, I found that I just wasn't all that interested. Perhaps this type of book just isn't my thing, and most likely, I'm just not smart enough to grasp all of the ideas. As I look back on this novel, I will admit that it did give me a lot to think about. And for that, I am very glad that I read it. I did appreciate the concept of the future selves and I liked how they changed based on the narrator's decisions. (I don't want to say too much more because it's best to experience these future selves on your own.) I also enjoyed the humor that was woven into the story (I know... it doesn't sound like a funny book, but it is.) And while some of the philosophy parts of the book bored me or were over my head, I did find some of the ideas presented to be rather interesting. Based on what I said in the last paragraph, I do think Q would make an interesting book club discussion... for some book clubs. I'm not sure my personal one would appreciate it, but I do think groups who are more focused on literary fiction and philosophy would. There is a reading guide available which touches upon some very thought-provoking themes. Some of the topics that you might want to explore include moral and ethical issues, technology, choices, forgiveness, love, redemption, and second chances. While I didn't exactly love Q: A NOVEL, I did appreciate it. And I do think many readers will enjoy this novel and find that this story resonates with them. I'm interesting in this novel...must be the philosophy background of my minor in college. I think its intriguing and would provide a lot of discussion for the right book club. Thanks for the honest review. I don't know why but I just hate books where a character is only identified by a letter. In fact, I won't read The Road since apparently the characters are never identified at all! And echoing what Serena said!!! Jill, the nameless characters in The Road works. Normally I hate that as well, but it worked for me there and I was more concerned about the hype over The Road...Loved it though. I have heard nothing but raves for this book, but I appreciate reviews that give me a contrary viewpoint. I'm not sure this is for me, but it does sounds like it gives you something to think about - how everything you do affects your "future selves." There is something about this one that makes me really want to read it. Soon I hope! I'll admit, the description and your comments have me intrigued. I am definitely interested in checking it out, but I might not run right out there and insist on getting it! Thanks for your honesty!